Norwegian soprano Lise Davidsen’s Rosenblatt Recital and London début, accompanied by James Baillieu at Wigmore Hall on 9 May 2017, started on home ground with five Grieg songs (in German). She went straight in with repertoire that she clearly loves. ‘Gruß’ was short and sweet, and the two slow songs that followed, 'Dereinst, Gedänke mein / wirst ruhig sein' (One day my thoughts will be at rest) and ‘Zur Rosenzeit’, had a perfect stillness and no gratuitous histrionics, which made them all the more powerful. She sang four of the six Op 48 songs of which the final one, ‘Ein Traum’, ends on a big fortissimo high note that demands applause. However she segue’d to the slow, quiet ‘En Svane’ (A swan) in Norwegian. Beautifully poised and obviously close to her heart. 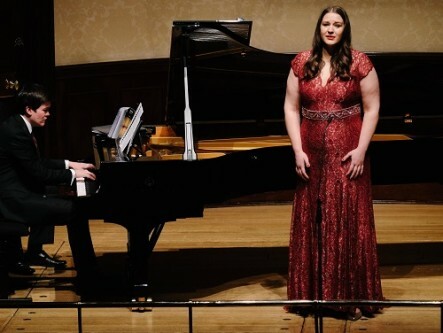 Davidsen told us that the rationale for the programme was to sing her favourite songs, plus arias she has already performed, is about to perform or wants somebody to engage her to perform. There is nothing manufactured about her stage presence, just a straightforward Norwegian country girl. 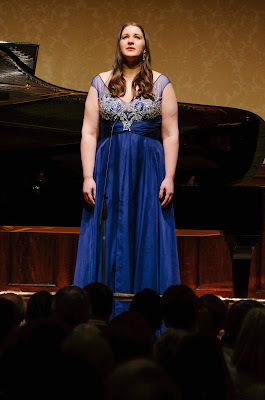 It certainly won over the Wigmore audience. She didn’t quite find the bel canto idiom of Cherubini’s Medea, but it was nevertheless thrilling to hear this steely voice at full throttle. Four Strauss songs followed, ending with ‘Cäcilie’ and two gorgeous quiet ones in the middle, with some exquisite silences from Baillieu who made us wait just a fraction longer than usual in ‘Morgen!’ Really classy music making from both of them and I bet in ten years’ time they will be even better. More unhappy mothers to end the first half: Amelia’s Act III aria from Un ballo in maschera not the best fit for her voice or sensibility (yet?) and Giordano’s ‘La mamma morta’ from Andrea Chener. My feeling is that the German, Swedish and Norwegian suit her so well, she’ll have a full diary without the Verdi or the verismo. In the second half, a change of frock and Santuzza’s aria, from Mascagni's Cavalleria Rusticana, showing both ends of this former mezzo’s range; the sound was too covered, though I did enjoy her unhinged body language. Next, back in Scandinavia with a group of five songs by Sibelius. She prefaced it with an explanation of the difference between the Norwegian sensibility (‘jolly’) and the darker but very romantic (‘in a Finnish way’). These songs were for me the high point of the evening. Everything worked: the dynamic range, the storytelling, the telepathy between Davidsen and Baillieu. They had us on the edge of our seats with the last one of the group was ‘Flickan kom ifrån sin älsklings möte’ – the girl came back from meeting her brutal, duplicitous lover and told her mother the truth after a series of fibs. Stunning. She communicates these songs in such way that we believe we actually speak fluent Swedish. Agathe’s aria ‘Leise, leise, fromme Weise’ from Weber's Der Freischutz was spectacular. This was followed by Elisabeth’s prayer from Wagner's Tannhäuser which starts abruptly in the concert version where we don’t hear anything of the Pilgrims beforehand. With the best will in the world, James Baillieu couldn’t make that Wigmore Hall piano go to eleven (not his fault). But Davidsen’s voice blasted into every corner of the hall and probably halfway down Wigmore Street. The control was amazing. She never once made us feel she was running out of steam. And to prove she had more in reserve, she came back on and did ‘Dich, teure Halle’ as an encore. As a second encore more Grieg, back to pianissimo in ‘Ved Rondane’. Again, perfect for her vocally and temperamentally. I’d be back like a shot to hear the two of them do a full programme of art songs.